„I am living beside a river. In Taipei. My Isar is the Danshui“, says Liu Chih-Hung, the 2018 residency artist of the residency exchange program between Munich and Taiwan. Organised by: Apartment of Art/AoA Munich, DAC Munich, Goethe Institute Taipei and Taipei Artist Village/TAV. Before Chih-Hung came to Munich, he took a look at the Munich map. What he recognised first, was the river. „A river! Like at home!“ was his first connection, the first nutrient for his imagination. When we go abroad for a time, our imagination travels ahead of us. The idea, and what it fixes on, but what is not necessarily true, that is what the installation THE HIDING SONG is about in the apartment of art. On the first day of his arrival in Munich he is at the river Isar. On the bridge behind the Praterinsel. The river is a surprise for him. People who bathe, barbecue, play, listen to music. Not at all like life at his river at home. And the light is not familiar. That is why blinds are an important element in Liu Chih-Hung's exhibition. Using blinds you can create so many variations of light and shadow, leaving the real world outside and giving space to the imagination. But what you see is not free from speculation. Liu tries to learn more about the river. The web leads him to the old Willy Michl Song - Isarflimmern (Isarflicker). Half Bavarian half standard German. The Google-Translator from Bavarian-German to English bugs the text, but the following translation from English to Chinese gives the coup de grace to the lyrics!….but still, some elements, linguistic and also onomatopoeic correlate again with Liu's romantic imagination. In reality, he goes to the grocery store to find something to eat. And what his eyes mostly catch is bread. So many different breads. Everywhere bread. Bread and Isarflimmern merge to the very funny work the talking bread in which a big bread with the voice of Liu Chih-Hung tries to bring the visitor closer to the Isarflimmern. Question: How does one manage to establish an inner relationship between the home and the here during an A I R in 2 months? "Always this Isarflimmern. This song, always „only“ the idea. But now something real must occur“, Liu thinks. 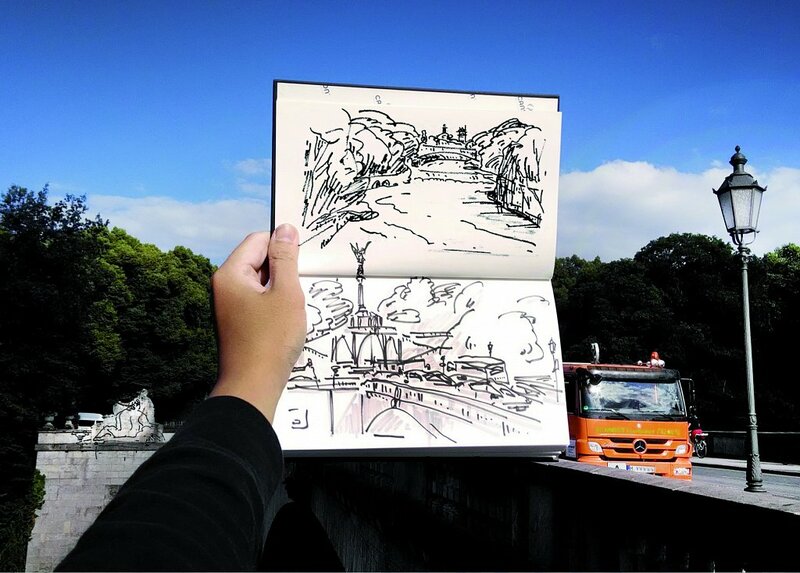 He wanders along the Isar and draws it. The landscape, the finds, the stones, the bridges, etc. Especially the stones draw his attention. They are so typical of the river, so real, so true (like bread, everywhere). Yet he begins to shape the stones out of clay, completely according to his feelings, haptics and personal aesthetics. And finally he feels like home in his own IMAGINATION.